Only #613 color for this type of extensions. To install this flip hair extension, just to put the transparent wire on your head, then pull out your hair over and over to cover the extension. The flip hair extension features an adjustable wire, which makes you like wearing a halo, so it has has another name - Halo hair extensions. 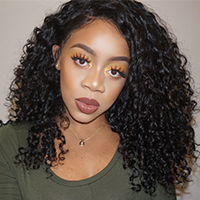 We pick the best quality Brazilian virgin hair as raw material to make the extension, the straight hair feels so silky and soft, which is the exact feeling real human hair could give to you.